Kristen Sieh and Libby King in “RoosevElvis.” Photo: Evgenia Eliseeva/A.R.T. CAMBRIDGE – Mixed media mash-ups are becoming more common as playwrights and designers become more adept and confident in melding film, projections and live stage action into one theatrical vehicle. The theatrical group The Team has incorporated some dazzling multi-media footwork into its “RoosevElvis,” being presented by the American Repertory Theater at its second stage, Club Oberon, through May 29.. The The Team produces collaboratively written pieces and its artistic director is Rachel Chavkin, the director of the ART’s award-winning production of “Natasha, Pierre and The Great Comet of 1812” this winter, now headed to Broadway. Because of the dynamics of The Team – with many hands involved, it incorporates many different ideas – “RoosevElvis” goes off in a lot of different directions, so hang on tight and go with the flow during the 90-minute production. “Rooselvis” tells the story of Ann, a shy 35-year-old meat-processing plant worker living in Rapid City, S.D., whose working-class world day often ends with TV and a six-pack of beer. Ann, who’s never been on a plane or far from home, has recently begun to inhabit the character of Elvis Presley at home, and the spirit of The King has given her the courage to go out into the world. After an online meet-and-greet Ann meets and sleeps with Brenda, a woman in town for a taxidermy cobnference who lists Teddy Roosevelt among her interests. After a weekend camping trip to the Badlands takes a bad turn, Brenda scolds Ann for her passivity – “You’re not brave at all “ – and urges Ann to do something, anything, like getting in a car and driving to Graceland. As Ann begins her real or imagined trip south – it’s never quite clear – she has company: The spirits of two macho 20th Century icons. The actresses also portray the “Rough Rider” himself, the 26th president of the United States, Theordore Roosevelt, played by Sieh, and Elvis Presley, an admirer of Teddy, played by King. The scenes between the two are a hoot, Sieh in fringed buckskin and Teddy’s trademark spectacles, with pasted-on mustache and sideburns, and bad wigs for both Sieh as Teddy and King as Elvis. 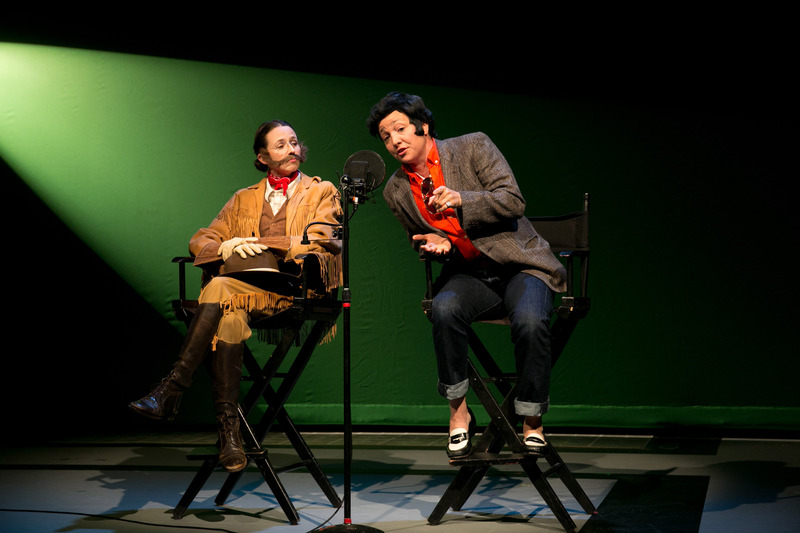 The imagined conversations between Sieh’s Roosevelt and King’s Elvis are the funniest moments in the show, as they trade factoids about their various feats and accomplishments and demonstrate their athletic prowess: boxing for Teddy, karate for Elvis. Sieh’s Roosevelt is a fat rich kid who found his groove and is now full of piss and vinegar, and King’s Elvis a more subdued sort. The two battle for Ann’s affections, urging her to be more like one or the other – or perhaps both. It’s an entertaining, fascinating road trip to be sure, perhaps the most gonzo one since Dr. Hunter S. Thompson was in his prime. The American Repertory Theater and The Team’s “RoosevElvis.” Created by Rachel Chavkin, Libby King, Jake Margolin, and Kristen Sieh with Matt Hubbs, Andrew Schneider and Nick Vaughan. Directed by Rachel Chavkin. At Club Oberon through May 29. http://www.americanrepertorytheater.org.